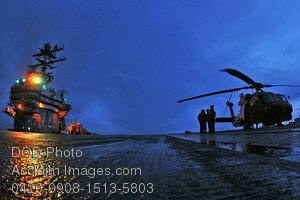 Description: Free, public domain image: Navy Personnel Preparing a Helicopter for Launch from the USS Abraham Lincoln. U.S. Navy flight deck personnel prepare a San Diego Coast Guard HH-60 for launch at dawn on the flight deck aboard USS Abraham Lincoln (CVN 72) Dec. 15, 2008, in the Pacific Ocean. The helicopter participated in a rescue in which an injured Sailor was evacuated to Lincoln and stabilized before being flown to San Francisco for treatment. Lincoln is underway conducting training and carrier qualifications. (U.S. Navy photo by Mass Communication Specialist 2nd Class James R. Evans.